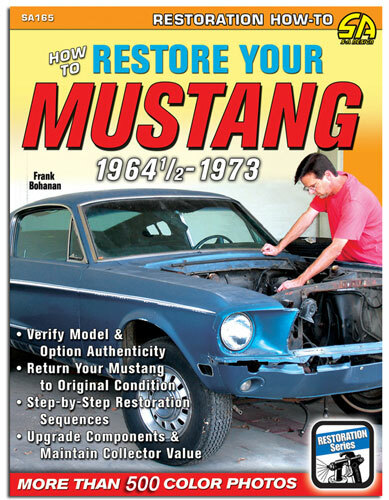 How to Restore Your Mustang 1964 1/2-1973 is a hands-on how-to guide to restoring you Mustang. While many previous restoration books have focused on authenticity and mostly overlooked the actual procedures for restoring a Mustang, this book breaks new ground by detailing how to actually restore each major component group - chassis / suspension, brakes, steering, body, interior and engine / drivetrain / differential. It provides all the relevant challenges, expenses, drawbacks, and benefits a restorer will encounter, so the owner / restorer can decide whether to do the restoration work on his or her own to have it professionally done. The latest techniques and best restoration products for each system are revealed and discussed. The book also specifies how to make sensible upgrades that improve safety, performance, and convenience while not adversely affecting collector value. 192 pages and over 500 color photos. Written by Frank Bohanan.